Breville BES870XL Espresso Machine Review: Why it Can be a Great Choice in 2018? Coffee Geek Lab / Breville BES870XL Espresso Machine Review: Why it Can be a Great Choice in 2018? One does not simply wake up without coffee. Even if you wake up moments before your alarm clock goes off, you don’t feel energetic or motivated until you get your cup of coffee. And there’s no better way to get a perfect cup of coffee than relying on professional barista’s experience. However, buying coffee at shops can be expensive. So, wouldn’t it be great if you could make coffee at home like a pro? In fact, you can brew great coffee at home if you have the right equipment for it. Thus, choosing the right coffee machine. Look: Breville, Ninja, Mr.Coffee, Nespresso, and Delonghi are just a few reputable brands that offer coffee machines. Since the market is too saturated, it may be hard to choose your espresso maker fast. If you’re looking for a high-quality home espresso machine, you need to pay attention to what other users say online. Reading genuine reviews is the best way to make the right buying decision and get a machine to suit your needs. 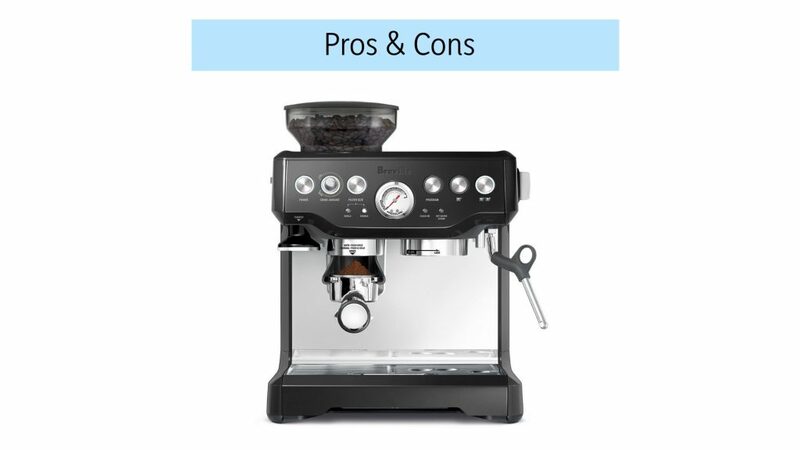 In this article, I’m going to tell you more about the Breville espresso machine so that you can decide whether it can be a good option for you. To begin with, this semi-automatic espresso machine has gained popularity and trust of coffee lovers thanks to its functionality and perfect quality. Since Breville barista express espresso machine is bare-minimal and intuitive, it’s a perfect choice for both professional baristas and average consumers. If you’re pressed for time or you just want to understand quickly whether this machine is worth trying, read our short summary. However, keep on reading the whole article if you want to know everything about the device (from top features to the price). If this preview has caught your attention and you’re all ears to find out more about the Breville espresso machine, you’re welcome to read the whole sum up based on my own experience and a number of other reviews made by real customers online. If you are looking for a coffee machine produced by a trustworthy company, Breville espresso machine is what you need. With over 85 years experience on the market, the Breville company has gained customers’ trust and loyalty. Putting their customers first, the manufacturer releases newer models of small home appliances to suit their needs best. 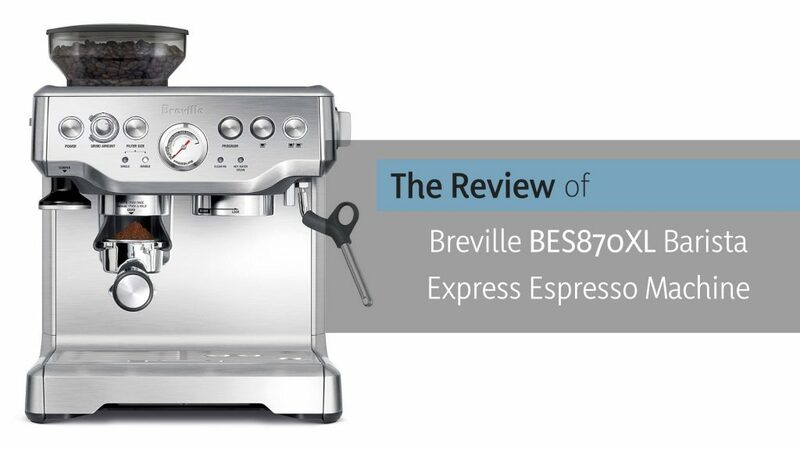 Thus, Breville BES870XL appeared to let people enjoy a perfect cup of coffee right at home. To begin with, it’s important to understand the top product features that make this machine stand out from other competitors. Integrated conical burr grinder has a maximum ground coffee surface area that provides users with the full espresso flavor. Half-pound bean hopper has enough space for storing and transferring of coffee beans. Adjustable grind size and amount let users find the optimal extraction and fineness. Hand-free grinding helps to dispense the freshly ground espresso into the filter which helps to get a perfect cup of aroma coffee. Thermocoil heating system controls water temperature. Adjustable temperature control helps to get the optimum coffee flavor, no matter what coffee beans you choose. Automatic filter size lets you choose single or double filter basket by default. 67 oz. removable water tank has a replaceable water filter to reduce impurities and scale. 54-mm tamper has flat surface for pressing the espresso, and it’s also easy to remove for tamping. Instant hot water which increases the speed for making the coffee. Clean me light shows when it’s time to clean the machine. Dry puck feature provides the easy disposal of the coffee puck. The Breville barista express espresso maker is easy-to-use. There’s no need to buy fancy complex coffee machines if you have a lack of knowledge and experience in using such coffee makers. Instead, you can rely on this semi-automatic espresso machine to make the most out of it. No matter how proficient as a barista you are, whether you’re an aspiring or professional coffee maker, you must want to enjoy a cup of quality coffee without putting much effort, and Breville BES870XL is right for you. It has two dual-wall pressurized filters that work automatically. Plus, you can adjust the settings to make the process easier – just press the button to get your favorite latte! Obviously, you want to get the best espresso shot every time you brew coffee. And if you’re a Breville BES870XL owner, be sure you get an ideal temperature and enough power every time you use the machine. The machine is a pump espresso maker with a special 15-bar manufactured in Italy. It also has a durable thermos-coil heating system with adjustable temperature control to get the optimum coffee flavor. And if you’re obsessed with cappuccino and latte, I have good news for you! This machine has stainless steel 360° swivel-action steam that allows users to create silkily milk texturing without much effort. As a result, you can your favorite coffee beverage right at home – just explore the art of espresso with Breville! Not only this machine has many great features but also it has a focus on customers’ preferences. Does good design matter? If yes, this machine can fit your needs. The Breville espresso machine has attractive stainless-steel design that most users will love. 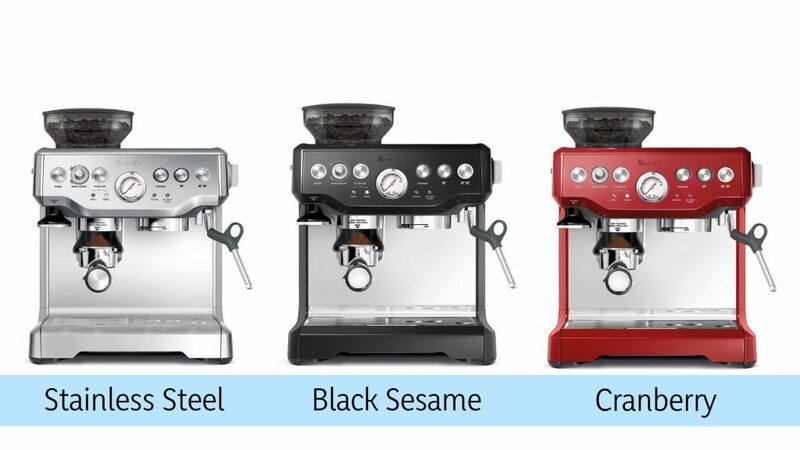 It comes in 3 colors (stainless steel, black sesame, and cranberry), so you can choose which one you love the most. The combination of the compact size and color variety helps any customer find a machine that fits any kitchen space. The bottom line? It’s a useful modern device that can come in handy for all coffee drinkers who want to get a perfect cup of coffee at home. And if you’re about to get this espresso machine, find out what you can get with your purchase. 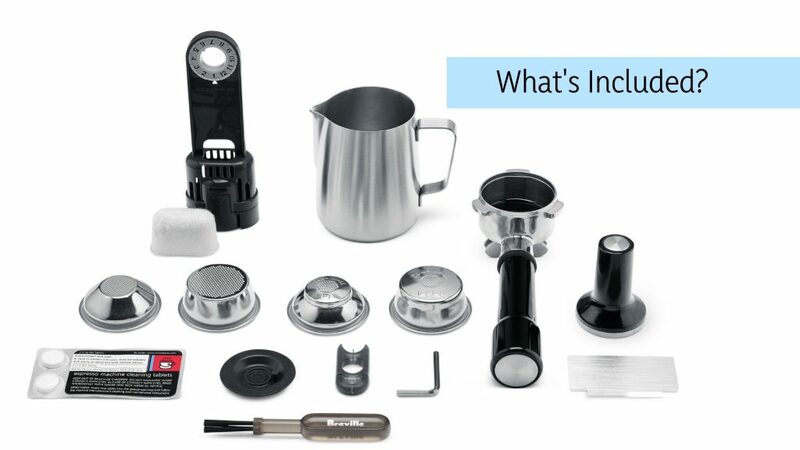 To enjoy your Breville espresso machine, you need to know everything about the product. And it’s necessary to understand what is included and where can you get additional items like water filters. NB: According to the official Barista Express™, all its parts that come into contact with the coffee, water and milk are BPA free. Keeping your coffee maker clean is a must to get tasty coffee at home. Looking after your espresso machine is a must if you want it to serve you for many years. Yes, it’s you who can help your machine serve the best coffee it possibly can. Even if cleaning bothers you, the payoff is huge over the long haul. With a great variety of coffee machines on the market, your perfect choice should be made with a focus on your preferences and needs. If you want to understand why Breville barista express can be the right option for you, check out whether my top 7 reasons can convince you to start using this device right now. It Has a Compact Size. No matter what your kitchen size is, Breville espresso can fit it perfectly. It can be an attractive and timeless addition to any kitchen. It Is Easy-to-Use. There’s no need to have great barista skills to choose out of 6 available options to make your perfect cup of coffee. Moreover, the machine has many default settings that make the process even more pleasant. It Has a Stylish Design. Available in 3 colors, customers can find which one suits their kitchen interior best. Even if you’re a picky user, you will definitely love this minimalist design. It Is Affordable in Maintenance. From CLEAN Me light to dry puck feature, the Breville espresso machine doesn’t need much care. Plus, cleaning kit is included, so you can clean the machine with ease. It Is a High-Quality Device. The machine has brushed stainless steel exterior that provides the longevity of the device. It also includes all important accessories you may need while using the machine. All in all, I believe that the manufacturer takes a proper care of even the most demanding customers as the company puts much effort into the production of high-quality devices that can serve long years. It Makes Excellent Coffee. The device has various features that help users get a perfect cup of coffee without sacrificing its taste or aroma. Depending on your preferences and mood, you can make espresso, americano, macchiato, ristretto, latte, or cappuccino. And ensure you’ve the right settings to get 1 or 2 cup shot volume. It Is Approved by Customers. Before using the Breville espresso, I’ve looked through hundreds of customers’ reviews available online. According to Amazon, this machine #1 Best Seller in Espresso Machine & Coffee Maker Combos which proves the quality of it. For a variety of reasons, Breville espresso maker can be exactly what you’re looking for. As a latte lover, I love the idea that I can get a cup of fresh coffee just under the 60 seconds sitting in my cozy pajamas. If you’re a coffee lover like me (who can’t wake up without a cup of aroma coffee), the Breville espresso machine can be a great option for your home. Adjust the settings in advance, and get your coffee with a few clicks. It’s easy like 1, 2, 3! Yes, the machine may seem expensive at first blush, and it may be difficult to spend $500+ at once. But think about all the features this machine has – from the Integrated conical burr grinder to a clean me light – it is a superb device with a focus on customers’ needs. Thus, the Breville espresso maker is a great investment that will save your time and money. So, is it time to become a Breville espresso machine owner?